Do you see your future working upstream or downstream? If you’re looking to work in the oil and gas industry, knowing what role suits you and understanding more about the components of the sector could be key to your success. However, with a lot of industry-specific jargon to bust, getting the lowdown on this can often be easier said than done. The oil and gas industry is big. Really big. In fact, it’s such a large and complex sector, that understanding and explaining the whole process from start to finish isn’t particularly easy. For this reason, the industry is generally broken down into the following three components: Upstream, Midstream and Downstream. Many companies working within the industry will generally choose to specialize in one particular part of the process. Some companies (known as ‘combined’, or ‘super majors’) may handle the whole process themselves, although there are a very small number of these companies operating within the oil & gas sector. BP, Total and Shell are all examples of combined companies. Upstream is the first part of the oil and gas process. It primarily involves the exploration for crude oil and natural gas fields, as well as its recovery and production. This sector is widely referred to within the oil and gas industry as the E&P (exploration and production) stage. Common areas within the upstream process include searching for oil deposits, either underground or underwater, the drilling of exploratory wells and, if deposits are found, the operation of these wells to bring found deposits to the surface. Upstream is a highly scientific area of oil and gas, with Geologists and Geophysicists involved from the outset to seek out where deposits may lie. Aside from these roles, potential jobs within the upstream oil and gas sector include Platform Installer, Petroleum Engineer and Pipeline Engineer. 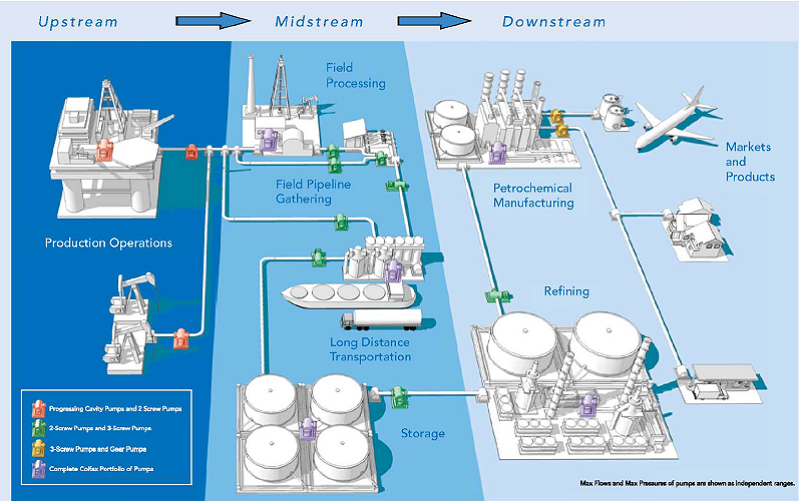 Midstream is the middle stage of the oil and gas process, and focuses on the storage and transportation of the deposits found during the upstream stage. The most common method of transportation, known as piping (or pipeline), involves vast networks of pipes being constructed and maintained to take the deposits downstream. Additional logistics include trucking, as well as the transportation via oil tankers and railways, in order to complete distribution. Although the activities within this specialism are sometimes included as part of the downstream process, midstream is a vital link between the upstream and downstream stages, and worth considering in its own right. Jobs within the midstream sector include Chemical Engineers, Pump Systems Operators, Business Advisors and Gas Managers, as well as Truck Drivers, Barge Drivers and other transport positions. Downstream is the final, and most varied, part of the oil and gas process. This could range from the refining of crude oil and processing and purifying natural gas, through to sales, marketing, product distribution and retail, and everything in between. It also includes the manufacture of petrochemicals and plastics. Many products derived from crude oil are manufactured during the downstream stage, including diesel oil, liquefied petroleum gas (LPG), petrol, fertilizers, antifreeze, pharmaceuticals and even cosmetics. Downstream is undoubtedly the sector in the oil and gas industry that provides the closest connection to everyday consumers, meaning jobs in this sector are incredibly sought after and diverse. Typical roles involved within the downstream process include, but are not limited to, Hazard Analysts, Tax Accountants, Maintenance Supervisors and Oil Traders. Why should I work in the oil and gas industry? Aside from being an incredibly diverse area to work within, the oil and gas industry is also one of the most lucrative. The average salary is well in excess of $25,000 – $50,000 per year, and continues to grow year-on-year. Other benefits include flexible working, the ability to travel globally as part of your career, and building a dedicated skillset that remain in demand within the right industries. If you’re looking for a career with longevity, varied and exciting work and excellent pay, there’s not really a better choice out there.